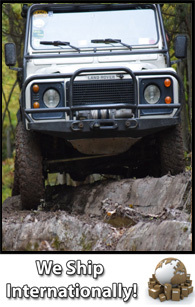 Our quality line of Land Rover Defender keychains, front grille badges, various decals, SDO & Bloody Knuckles Brotherhood t-shirts, hats, and more! 'Series-Defender Outfitters' wall banner 55"x33"
"Bloody Knuckles Brotherhood" PATCH velcro-backed, 2-5/8"
Adult T-Shirt (or Youth option) bearing the "Bloody Knuckles Brotherhood" logo on the back, with a smaller logo above the breast on the front. Available in various sizes. 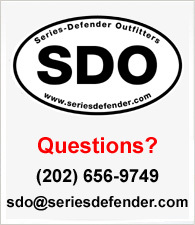 Hat featuring the "Series-Defender Outfitters" logo on the front. This hat is a low-profile, unstructured washed/distressed cotton twill. One size fits all. Hat featuring the "Series-Defender Outfitters" oval logo on the front. This hat is a low-profile, unstructured washed/distressed cotton twill. One size fits all.